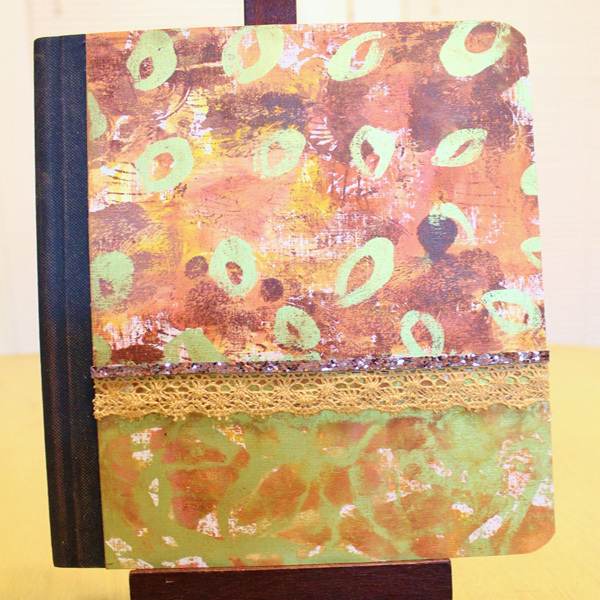 Project Description: Customize your own journal with Grafix Monoprint Plates. 3 – 8 X 10 Monoprint Plates come in a pack. The sheets are covered with a protective blue film on the front and the back, so remove the films first. 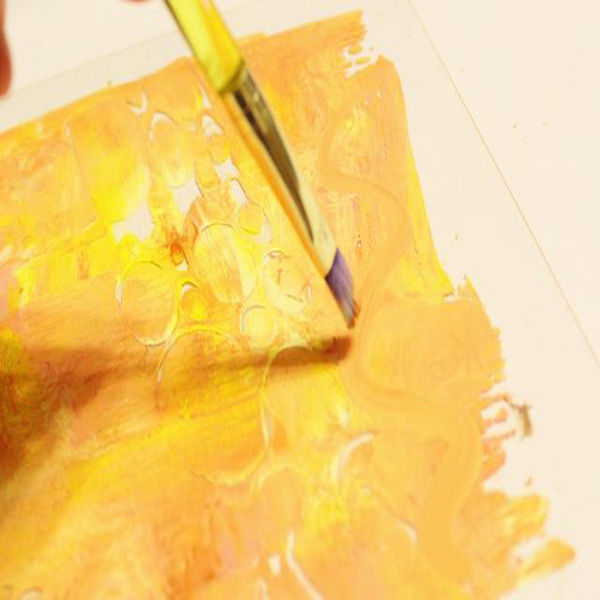 Add swirls of ink, using 2-3 colors, to the Plate. Use Color Wheel and Handle to gently blend inks and spread over Plate. Press Molding Mats into ink to create patterns. Use a paintbrush to add hand drawn accents on Plate. You can also use the end of the paintbrush to draw designs. Lay card stock over Monoprint Plate, top with cover sheet and then use brayer to press ink to paper. Then heat set inks. Clean Plate to prepare for next layer. Add inks, 2-3 colors, in a few spaces on Plate. Use Color Wheel to spread ink on Plate, but don’t cover the entire surface. Use Molding Mats to impress and re-stamp images on Plate. Add swirl designs using end of paintbrush. Impress design to card stock as before to create second layer; heat set. Clean Plate and use paintbrush and Gold Ink to create leaf designs on Plate. Impress paper again to add third and final layer to paper; heat set. Begin making second paper: clean Plate and tear and apply strips of blue painters tape to it. Add swirls of inks, 2-3 colors, spread and blend using Color Wheel. Remove tape from Plate to reveal ink pattern. Add thin swirls of Gold Ink to Plate. Impress design onto white card stock as before. Spritz Plate lightly with water, then dab with a textured paper towel – reserve towel. Impress as before to finish second paper; heat set. Trim papers to fit composition book. Adhere papers to composition book. Adhere lace where the papers meet. Adhere metallic trim above lace. Rub reserved paper towel across spine to transfer some ink; heat set.